I am not a fan of Asian food. At all. Well, besides sushi. But, for the most part, Asian food and me just don’t mix. I have tried a number of items and just find its not for me. Last month, we were meeting family for lunch at, what other than, an Asian place. Stir Crazy, located in Coconut Point, serves up Asian fare. In addition, they have a ‘Fresh Bar’ where you can select all the veggies you want and have them Stir-Fry it for you right then and there, with your choice of meat and rice. Obviously, this is what most people go for because, why not, its fun. I was totally not looking forward to this but, lucky for me, it ended up not being too bad. While this would not be my first place to pick, I was more than fine with my chance to Get Crazy. I opted to get my stir fry without a meat choice. For my carb, I went with the Brown Rice. The server took our order than brought out our bowls. When you are ready, you go up to the veggie bar. 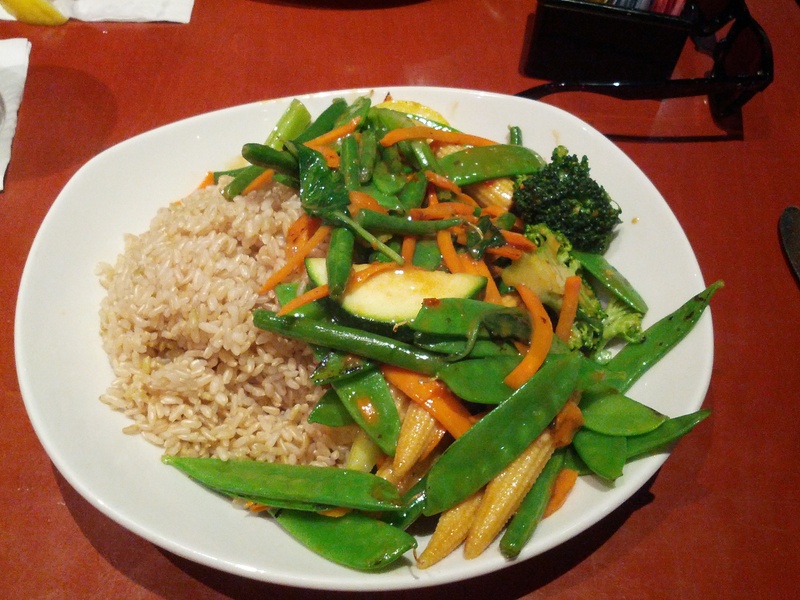 I opted for a variety of veggies – I got baby corn, snow peas, carrots, squash, mushrooms, brocoli, spinach and green beans. For my sauce, I opted for the Peanut Sauce. Once I had this ready to go, I handed it over to be cooked. The chef cooked up my veggies and added the peanut sauce. Then, he added these to a plate with brown rice. I brought this back to our table – as it was completely steaming hot – and stirred it around to cool down. I found the veggies to all be cooked nicely. My only beef with these was that the brocoli was still a little bit too raw for me. I’m not a fan of raw brocoli and this was pretty crispy. But, other than that, the rest of the veggies were really good. I found there to be a lot of peanut sauce on the bottom so, I mixed it around with the veggies and rice. Before doing this, I tried the rice and found it to be crazy dry and flavorless. Mixing the rice with the peanut sauce and veggies was the best option – this provided the rice with flavor and some moistness. It is hard to really say much more than that. I thought all of the veggies were good, the sauce was not too sweet and the rice (once mixed up) was decent. Overall, this was a good lunch. I found that it did not overly fill me up but at the same time, I was not left wanting for me. I did not like the prices at all – it cost $45 for 3 of us at lunch. I might be cheap but, that is wayy too expensive. I certainly won’t go out of my way to visit Stir Crazy but, if I have to go again, I will get exactly the same thing. Asian food is not for me but I will take any chance I get to Get Crazy.